Matilda Duffy, 22, is taking on the Edinburgh Half Marathon in May for the Stroke Association after her dad, Chris, had a stroke seven years ago – when Matilda was just 14. The aftermath of Chris’ stroke had a big impact on not only him but all of the family and he lost all of his speech. “Dad’s stroke meant a lot of things changed. Dad was no longer able to drive or travel independently, so everyone had to help Dad get about, take him shopping and attend appointments”. Despite having very limited speech still to this day, Chris has, however, relearnt to communicate and participate in an active and completely normal life. “I think as much as things changed, he’s still the same old Dad, especially since he’s regained much of his independence!” Matilda explained. Chris attends his local Stroke Association group which has helped him to build a wonderful network of friends. 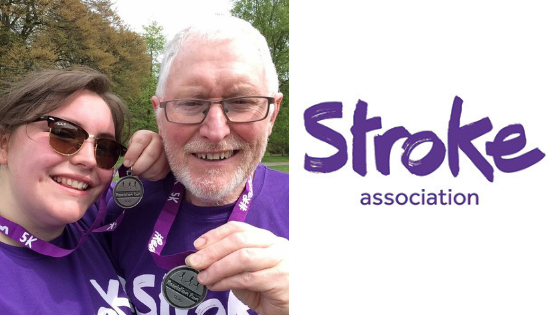 For the last two years Matilda & Chris have both participated together in their local Stroke Association Resolution Run. Despite not considering herself “a runner” this has inspired Matilda to take a step up to a more challenging distance at the Edinburgh Half Marathon. Chris is a wonderful inspiration to Matilda and it makes her proud to see how far he has come. Matilda is passionate about helping people who have suffered a Stroke and is currently at university, training to become a speech and language therapist, in part due to her dad’s experience. Second only to London in terms of size in the UK, the Edinburgh Marathon Festival has nine races on offer, guaranteeing there is something for everyone from the seasoned runner to children just starting out on their running journey. The fun kicks off on Saturday 25th May at Holyrood Park with a 10K, 5K and four junior races. On Sunday 26th May the Edinburgh Marathon, Edinburgh Half Marathon and Team Relay start from the heart of Edinburgh City as runners embark on new city centre route launched in 2018. If you would like to join Matilda & the rest of Team Stroke at Edinburgh Marathon Festival, please click here.